Athena searches for a champion to lead her forces against the Goddess of Darkness! Enter the Battle Royal to prove your might and become her Emperor! As many ready themselves to fight for Athena’s cause, Nox’ influence over the land has weakened. Scouts have reported that Battle Fury now lasts for a shorter amount of time. 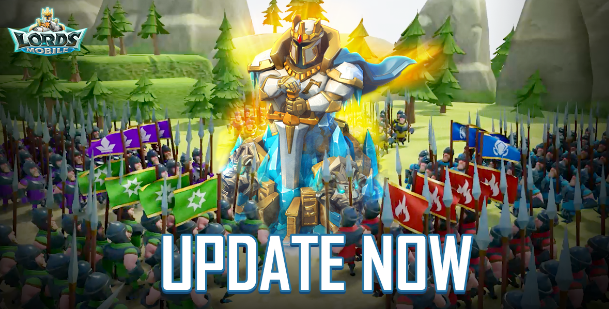 # New Event: [Battle Royal]! Prove yourself worthy of the throne to be crowned the Emperor and win the great prizes. # Added World Rankings (Unlocks at Lv 25 Castle). # Reduced duration of Battle Fury from up to 20 minutes to 15 minutes. # Guild Leaders can now change their guild’s home kingdom. # New Guild Fest Requirement: Only available to players with Lv 15+ Castles . # Added new Turf Quests. Once the event opens, players can teleport to Battle Royal and begin their mission to claim the Wonder objective. The victor is the player with the highest total accumulated time spent owning the Wonder. The victor will claim the title of Emperor. 1.Participants cannot own the Wonder unless they are in a Guild. 2.The Lord owning the Wonder will not be able to change Heroes stationed in defense of the Wonder. 3.Recalling armies results in forfeiting ownership of the Wonder. 4.Participants can Rallies among their guild mates, or reinforce guild mates. If Wonder is successfully taken by a Rally coalition, the Commander of the Rally will be the owner of the Wonder. The Emperor can bestow a Kingdom Title onto a Kingdom through the Kingdom Selection menu that grants a boost to all players that have the Kingdom as their home Kingdom. A Kingdom can only be bestowed one Kingdom title at any one time. Once bestowed, a Kingdom’s title cannot be changed during the Emperor’s tenure. Imperial Titles: Emperors can also bestow Imperial Titles to individual players from any Kingdom. Each player can have up to one Imperial Title from the Emperor and one Vassal Title from the Overlord at any one time. Emperor’s Bounty: Gifts awarded to individual players at the Emperor’s choosing. Comes in the form of chests. Imperial Chronicles: A record of past Emperors and their accomplishments. Tip: Search for "K71" on the world map to quickly locate the Royal Battleground!